WHAT IF I DROP SOMETHING ON MY POLISHED FLOOR AND CHIP THE SURFACE? Relax - it can be fixed. We can fill the chip with several different product options, then the spot can be re-polished to blend in with the existing floor. Although we do our best to match the surrounding material, sometimes the patch may be slightly visible in the finished floor. WILL MY POLISHED FLOOR STAIN IF I SPILL PRODUCTS ON THE SURFACE? All spills should be cleaned as soon as possible. Our polished concrete floors are coated with a stain resist product which helps protect against water and oil based stains. However, acid based stains or those left for a long period of time render the polished concrete more vulnerable to staining. 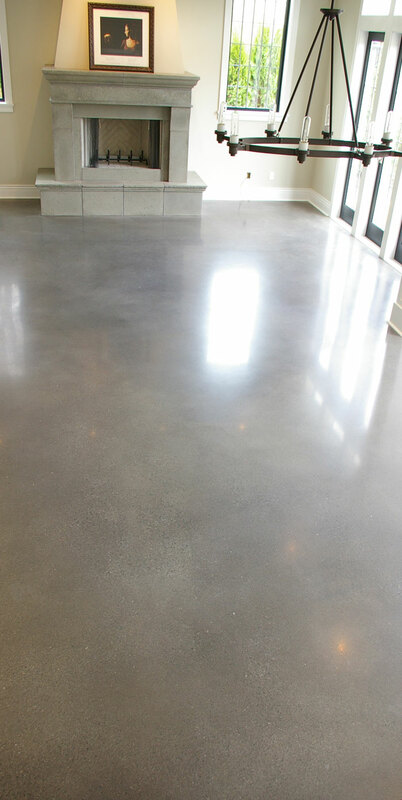 When polished concrete floors are kept clean and dry, they are typically no slicker than any other concrete surface. Polished concrete floors tend to be less slippery when compared with waxed linoleum or even polished marble. WHAT IS THE COST OF A POLISHED FLOOR? Each project is custom to the customer. As such, there is a wide range of pricing. For example, a warehouse setting that only requires a little edge grinding at $2.50/ft2 versus up to $12.00/ft2 and beyond for a smaller project with coloring options. Each project is unique, and we look forward to working with you to find the options that best fit your needs. Contact us today for a free quote. Although polished concrete is not typically recommended for exterior applications due to it's slippery surface, we have created a solution with a modified process resulting in a similar aesthetic with a more appropriate surface. A little, we do our best. The process is not dust-free. However, the machines are connected to vacuums which greatly reduce air particles. Sometimes we need to wet-polish to expose more aggregate, this process produces a wet slurry that we do our best to contain and safely dispose of. Between 200 ft2 to 1000 ft2 per day/per machine can be achieved. This average depends on the layout of each individual floor. For example, a wide open space without the constraints of other trades and materials makes a huge difference. WHAT IS THE SMALLEST JOB YOU TAKE ON? This is for your wallet to decide. A pretty simple rule is...as the size of the project goes down, cost per sq/ft goes up. At a certain point, it is not cost effective. Where is this point? Usually anything under 300 sq/ft.